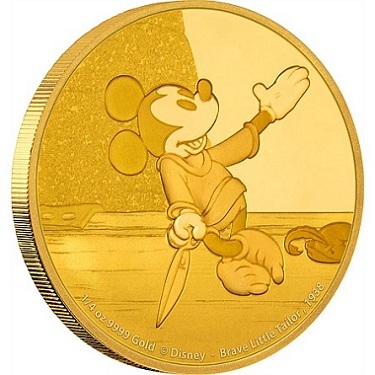 The New Zealand Mint is continuing its “Mickey Through the Ages” series with new gold and silver coins featuring the 1938 Mickey Mouse cartoon, “Brave Little Tailor.” The film was based on Grimm’s fairy tale of the same name and went on to be nominated for an Academy Award. This design is available on three coins: a silver one-ounce colored issue, a 1/2-gram gold coin, a 1/4-ounce gold piece, and a one-ounce gold coin. 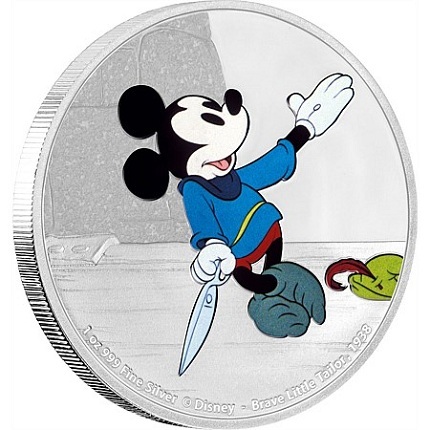 The reverse features an image of Mickey Mouse from the film; the Mint’s product page for the item points out that at this point in the story he is preparing to leave town to fight a giant. Inscribed along the rim of these coins are DISNEY, BRAVE LITTLE TAILOR, 1938, and the weight and fineness of the metal. The one-ounce silver coin carries a color image of Mickey with the background rendered in silver. It is available for $85 and has a mintage limited to 10,000 pieces. The gold coins carry the same reverse, but do not include the color enhancement. The 1/2-gram coin is available for $75 and has a mintage of 5,000 coins; the 1/4-ounce piece costs $620 and is limited to 1,000 pieces; and the one-ounce issue is priced at $2,500 and has a mintage limit of 500 coins. 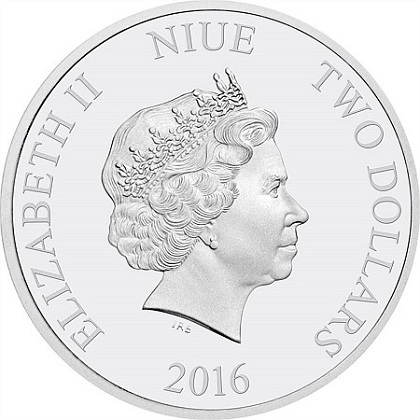 All of these issues share an obverse design that includes Ian Rank-Broadley’s effigy of Queen Elizabeth II, with the inscriptions ELIZABETH II, 2016, NIUE, the country of issue, and the monetary denomination. The silver coin is composed of 99.9% silver and the gold coins are 99.99% gold. For more information on the New Zealand Mint’s Mickey Through the Ages – Brave Little Tailor coins, please visit the Mint’s Web site. Throw bullion, Coins, Franklin Mint, POGS, Comic Books, internet into a blender – THIS is what you get.